A new dawn is on the horizon. A bright and shining dawn, marked by a single event, never seen before. 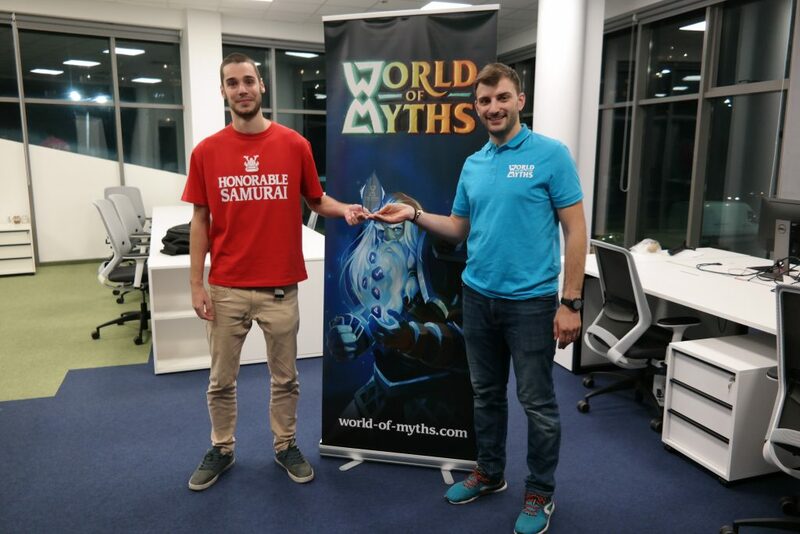 For the first time EVER on October 28th in the CampusX facilities in Sofia, Bulgaria an invitation-only tournament of World of Myths was conducted. Sixteen local players, several huck-ups, treats, prizes and a whole lot of FUN. For our first tournament, we’ve brought 16 local players that are excited about the game. Up to that moment, none of them have played World of Myths. The only info they had was the one available on our youtube channel and our blog. They had to “learn to play” from scratch. Upon registration, each player received a T-Shirt showing their allegiance – Elite Hoplite for the 2 Greek players, Honorable Samurai for the 6 Japanese players and a Raiding Viking for the 8 Norse players. With everyone on board, the rules were set – first, everyone would had to go through the tutorial of the game. Then we would have had 4 swiss rounds and semifinals for the top 4 contenders. We had some small prizes that we gave at random for 5 of the participants. 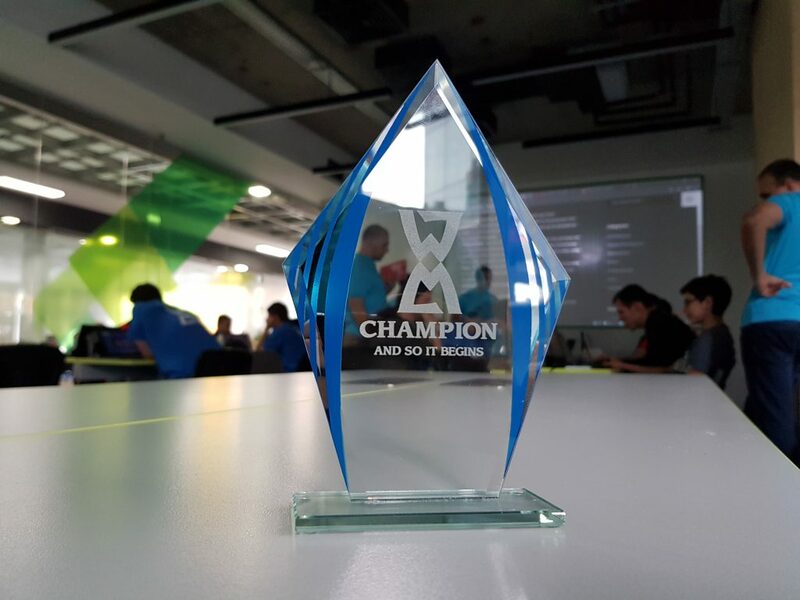 The finalists would have received a small cash prize and the champion would get a trophy, the in-game demigod title (which can only be obtained by winning one of our tournaments), and a chance to design a leader for his faction. The prizes were announced, the stakes were raised and it was time to play. Since none of the participants had ever played the game, naturally they had to pass the tutorial. Sounds easy enough, but… it wasn’t. Sure, it wasn’t “a journalist playing Cuphead” hard, but certain technical difficulties made this step a bit challenging. A swift reaction from our dev team was enough to put the tutorial bot in his place and the players were able to finish the game instructions. After the tutorial, everyone had some time to review the available cards and to build their deck or use one of the predefined ones. As soon as everyone was ready, the pairings for the first swiss round were selected. We used The Jousting Pavilion platform to determine the rounds and strength of schedule. The first round was set to be а “2 wins out of 3” for a win in the round. However, the connectivity problems dragged this round for way too long and we had to cut the next rounds to “1 match only”. During the lunch break, our dev team swooped in again and fixed the connectivity issues in no time. From the 2nd round on, we met no significant performance headaches and we breezed through the rest of the event. The rest of the tournament was filled with positive energy, strategy, and excitement. Naturally, the players were developing and discussing new tactics, different combos, and possible gameplay styles as the event progressed. We collected plenty of useful feedback, opinions, and suggestions that we hope to implement soon. The games were quite intense with more than a few solid comebacks. After the 4 swiss rounds, we were able to determine the semifinalists – Vladimir Tsintsarski and Plamen Zhechev of the Japanese Mythology and Teodor Mirchev and Dimitar Dimitrov of the Norse Mythology. All of them performed superbly in their matches and deservedly secured their place in the Top 4. Unfortunately, the Greeks were underrepresented and no player representing them made the cut. Both Norse players were using Odin as their leader while Vladimir from the Japanese was playing with Hachiman while Plamen relied on Amaterasu. The semifinals represented two battles between the North and the East, in which different factions prevailed. The final was no less intriguing with Vladimir (RoanFx) playing Hachiman and Teodor (JiNn) playing Odin on the opposing sides. A clash between the Norse fury and the Japanese discipline. A fierce battle with only one winner. Vladimir managed to cut down the opposition all the way to the top and claim the title of Champion. A big win for him and the Japanese mythology. We’ve learned a lot from this tournament. We received plenty of constructive notes that we will implement in the upcoming versions in the game. We encountered unexpected bumps and managed to patch things up accordingly. But the most beneficial lesson was that the players are having fun with our game. 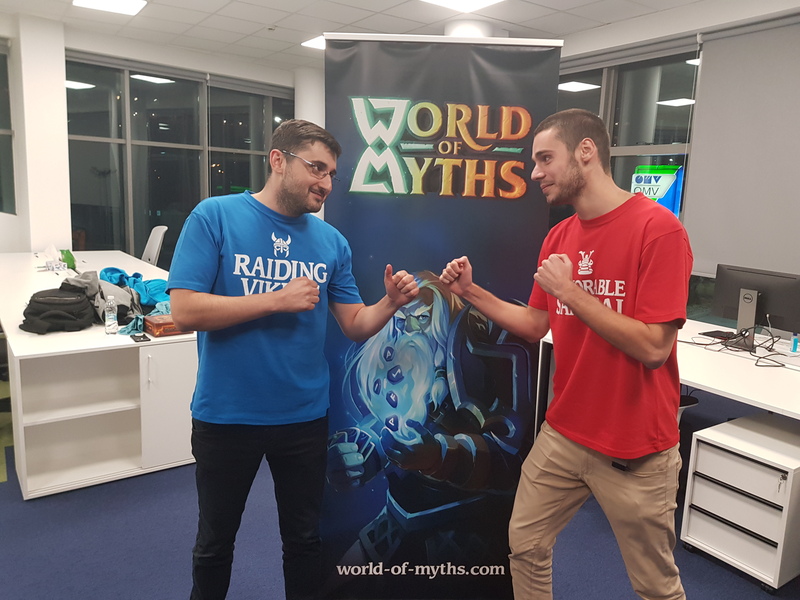 The atmosphere, the lively discussions of game mechanics and lore, the excitement before every duel… Seeing that people are having such a great experience with our game – there is no feeling such as this one. Namely, this is what motivates us, what drives us forward to improve and polish the game, to make our vision for the game come true. With our tenacity to push forward and with the help of you – our community, we’re confident that we can create something very, very special. We would like to thank the players for participating and we hope to see you again at the next tournament.